The only way I can think to describe Megane is “a movie for B-type personalities”. It ambles along at a pace that – to the outside observer – seems foreign, but somehow fascinating. Other than that, it’s hard to pin down. The film builds its own internal language of keywords and signs, yet offers the viewer no interpretation or meaning, remaining neutral. The meaning, of course, is that there is none: things like signs and symbols, even when presented with the intricacy seen in the likes of Megane, are meaningless. 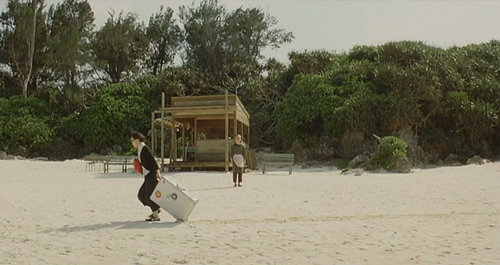 The film begins with our protagonist, Taeko, dragging a metal suitcase through the sands of Japan’s southern reaches. Dwarfed by the scenery and the emptiness, the bright orange of her handbag and the glean of light on her suitcase draw our attention. She arrives at an inn where the sign is so small it’s nearly illegible. Why? Because a bigger sign would attract too many people. This kind of logic rules Megane: subtle, simple gestures with ambiguous consequences. During her stay at this inn by the sea, Taeko is introduced to the concept of ‘twilighting’. To be more specific, the word tasogareru is in use here: a more specific look at it reveals the idea of fading away into the twilight or dusk; to decline, wane and abate. The verb is in its potential form, and thus the meaning is the ability to wane, the ability to fade, and not simply the act of it. A loaded gun of a word, for sure. Megane‘s sense of time seems only to be measured by way of the occasional meal, eaten amongst all the twilighters in this town by the beach. Sakura, the eldest, runs a shaved ice stand on the beach, coming every spring and disappearing with the first summer’s rain. 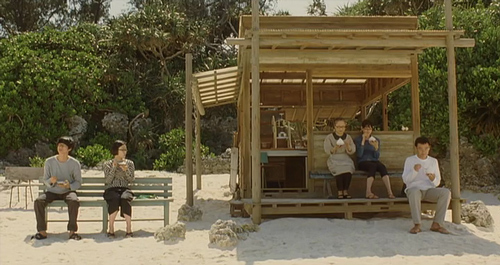 She brings nothing with her but a plain cotton purse, and in payment for her shaved ice takes only small mementos: a mandolin song from Yuji, the innkeeper or origami from a young girl. Other than that, Taeko knows nothing about her, or the other twilighters: they exist without attachment, drifting and fading into the scenery. The symbolism is obvious: her heavy metal suitcase contrasts a landscape of white beaches and green trees. Her wardrobe reflects this contrast, visually: her shirts are all sharp black-and-white lines, perfectly ironed, her hair always in place. The other twilighters wear almost wholly earthy tones, blending into their backgrounds seamlessly. Taeko stands apart from it, and refuses to integrate, her metal suitcase obstinately beside her. True to form, however, Megane gives us only the barest hints of what Taeko’s baggage might be; introducing a student of hers, but never going further into their relationship. The turning point in the movie comes when Taeko, wishing to escape the inn, drags her luggage across a farm field. Sakura, passing by on a passenger tricycle, stops to pick her up. Unable to carry both the suitcase and herself, Sakura stares, wordless. Taeko drops her baggage in the middle of the path, and moves forward, carried on the back of an old woman’s tricycle. She leaves the inn wearing pure white (the color of death) and, upon her return is seen in a plain green shirt – a symbol of rebirth, and a quiet hint at her integration with the twilighters. 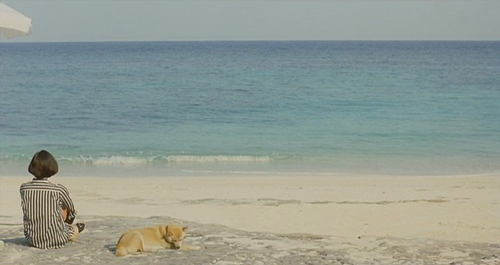 Megane is a movie which simultaneously urges its viewers not to analyze it, all the while providing miniscule hints to be uncovered, like rocks in the sand. In response the core of the movie – the act of twilighting itself – Taeko is given the vague instructions to “think on your past, or of someone dear to you”. It seems to involve a slow fading into the scenery, a reminiscence brought about by shaved ice, or crocheting on the beach. This is all conjecture, however. To twilight is probably to stop trying to analyze life, and to live it as no-nonsense a manner possible. It’s great irony that Taeko’s introduction to twilighting ends up saving her. Unfortunately in the US that happens only rarely, nursing homes here have an aura of death that seems to cause people to die faster when they get there. Do you think the beach/ocean imagery is meant to reflect something like the Viking burning ship/burial at sea idea? This is hardly a movie about death, simply about a space inbetween. It’s a bit difficult to understand it without watching, but basically think of the oceanside as a scenery which washes things away – the idea of twilighting is something, in turn, which simply washes away the complications of modern life?